Join us in Manitoba for our Annual golf and networking reception! Dine and Discover with ACTA in Saskatoon! ADVISORY: Closure of Sinorama Vacations Inc.
Last week, Sinorama Vacation Inc. in Quebec, Sinorama Holidays Inc. in Markham Ontario and Sinorama Travel in Richmond BC ended its operations. ACTA has provided a summary of where you can obtain information to assist your clients file a claim against the Compensation Funds within these regulated provinces. ACTA Corporate Partner, Velas Resorts is offering Summer nights and kids free promo! Take advantage of Velas Resorts' Special Sale, and enjoy great rates and extras! 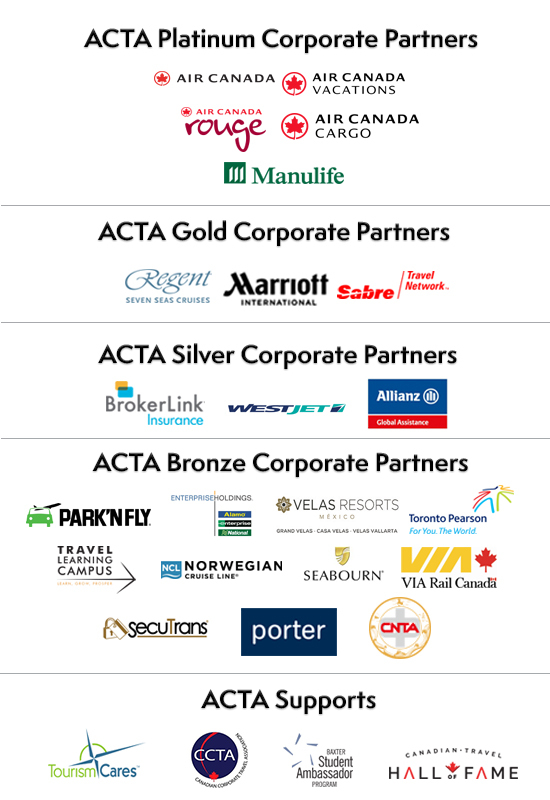 ACTA endorses Continuing education programs that facilitate professionalism and increases your level of experience with a destination or product. The available courses offer credits that can be applied to your workplace experience for those working on their professional designation of Certified Travel Counsellor. ACTA would like to invite you to take a listen to our webinar on July 18, 2018 with Ritu Shannon, the Senior Manager, Travel Agency Sales Canada of Enterprise Holdings. As she gives an overview on ways to save your customers time and money when renting a vehicle with the Enterprise, National and Alamo brands.